Hi all, this is just a mini update while we work on some bigger stuff for you guys. Hoping to get it to you next month! Edited by AZ Leader, 23 March 2018 - 04:12 PM. wasn't sure you wanted any discussion in here so check that thread devs. may we get a full list of new unis and rares so that collectors know what new ones there are ? Edited by bossfighter7, 15 March 2018 - 02:41 AM. Unique guitar!!! Also unique Manning!!!! In fact, I'm looking for the worst possible uni version of the Manning. Edited by Lana Woo, 15 March 2018 - 04:39 AM. sweet new unis and infamous items. 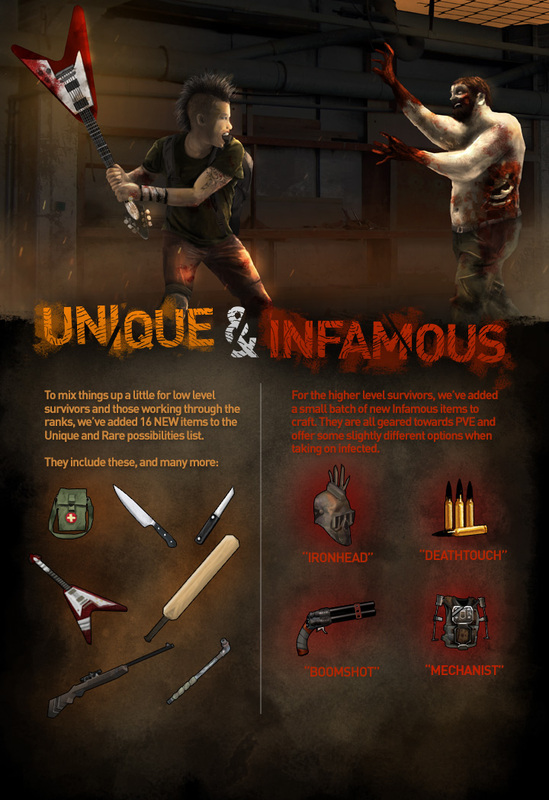 Oooooh, infamous pistol, I already like this. Buuuuuuuuuuuuuut I don't see what's too nice about it. None of the bonuses (other than the hit chance) will affect the dps nor is it even improvised.........which seems like it will lack in dps at first glance. Haven't actually crafted one yet, but I will to see what it's really like. Edited by Luisssboom, 15 March 2018 - 07:44 AM. nice but when did you become Duke Nukem ?